Ever since I started this blog almost a year ago (our first anniversary is rapidly approaching), I’ve toyed with the idea of writing a post along the lines of “The Ten Essential Children’s Books You MUST Have in Your Home Library.” It’s the kind of article that’s easy to write, it attracts traffic, and it can be a great discussion starter, if done right. (If done wrong, it can be trite, repetitive, and disposable.) However, every time the idea occurs to me, I find myself paralyzed when it comes to trying to define the criteria for the list. What makes a book essential? Will my definition of “essential” correlate to other parents’ definitions? How can I say that these ten books have more inherent value than every other book ever published? I’ve just never been able to tackle the topic in a way that makes me comfortable. But, with all that said, I will say that, if your kid doesn’t have their own copy of Brown Bear, Brown Bear, What Do You See? 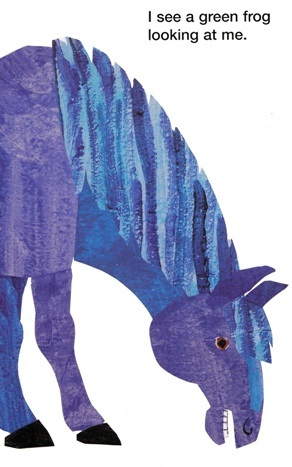 by Bill Martin Jr. and Eric Carle, there is something truly significant missing from your home library. 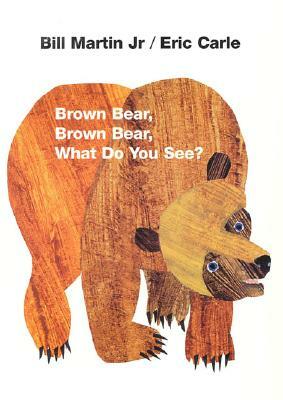 Is Brown Bear, Brown Bear, What Do You See? an “essential” children’s book? To me and my subjective definition of “essential”, yes, it is. Why? There are a lot of reasons, but if I had to pick one, it would probably be this – it is a magical picture book to read aloud to a young child. For younger readers (and I’m talking mostly about kids ranging from newborn to around three years old), it seems like most of the books targeted at their age group fall into one of FOUR main categories. First, there are STORY books. These are books that – surprise, surprise – tell a story. They have a beginning, middle, and end. They follow the arc of a character from point A to point B. Maybe they have a message or moral to convey. Most books fall into this category – fairy tales, legends, Red Riding Hood, Madeline, Strega Nona, etc. The third category is BASIC SKILLS books. Alphabet books, color books, baby face books, and word books all fall under this rubric. These are titles that are trying to convey fundamental education principles to children in the most interesting and engaging way possible. The fourth and final category covers what I call CADENCE or RHYTHM reads. These are books, normally picture books, that care more about imagery, inflection, and atmosphere than story, interactivity, or life skills. These are titles with poetry in their souls. These are books that were simply made to be read aloud – books that are written in such a way that, when read out loud by a parent or guardian, they inspire a sense of calm and well-being in their young captive audiences. These are the ultimate bedtime reads – books with such an ingrained rhythm at their core that, under the right circumstances, they can lull an excited child to sleep. Margaret Wise Brown’s Goodnight Moon is probably the best example of a cadence or rhythm read. It’s not trying to teach anything and there’s no real story to it. The book unfolds more like a nighttime prayer than anything else. When read aloud, Goodnight Moon comes across like a mantra – it’s a warm, inviting chant that calms the mind and body like a yoga instructor leading you through a post-workout cool down. So, what’s so special about Brown Bear, Brown Bear, What Do You See? For starters, it’s a beautiful book. 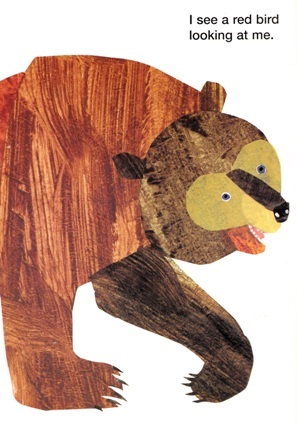 Eric Carle is one of the best known children’s illustrators of all of time, and I think the image of his inquisitive Brown Bear is almost as iconic as his Very Hungry Caterpillar or the Grouchy Ladybug. And so on and so forth. Like I said, Brown Bear, Brown Bear could be seen by some as just an ordinary animal and color book. A book that teaches kids that bears are brown and frogs are green. (And horses are blue… apparently.) But that reductive reading ignores the poetry at the core of the book. And I really do think that Bill Martin Jr.’s plain, direct text in Brown Bear, Brown Bear transcends basic color and animal facts and ends up acting as a meditative mantra more than anything else. By definition, a mantra is described as either “a word or formula… chanted or sung as an incantation or prayer” or as “an often repeated word, formula, or phrase, often a truism.” And I feel that definition is an accurate description of what it’s like to read Brown Bear, Brown Bear, What Do You See? The book utilizes these simple, repeated factual phrases (“I see a brown bear, I see a yellow duck…”) to create this wonderful cadence, this palpable sense of plain-spoken calm. 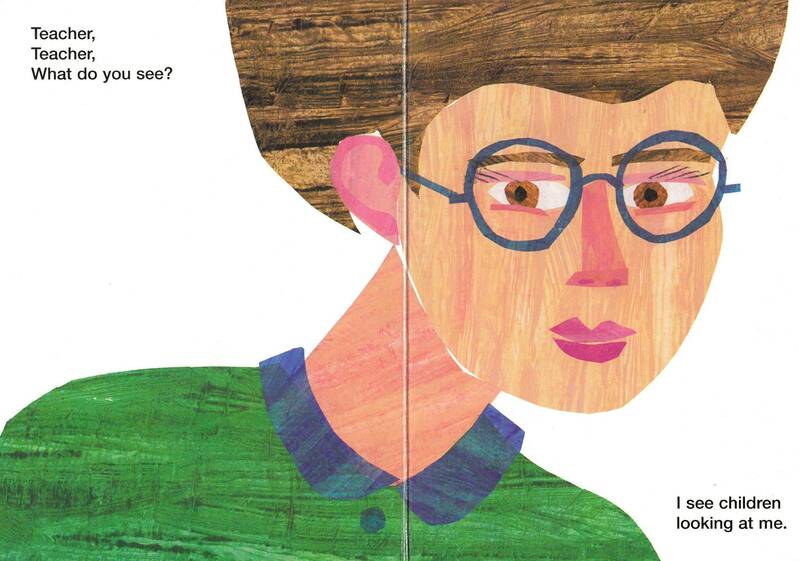 And that narrow bridge between a basic skills book and a work of poetry is particularly crossed in the book’s later pages, when Martin and Carle decide to change up the formula and show us a teacher and a group of children also observing the animals. And I loved that response. 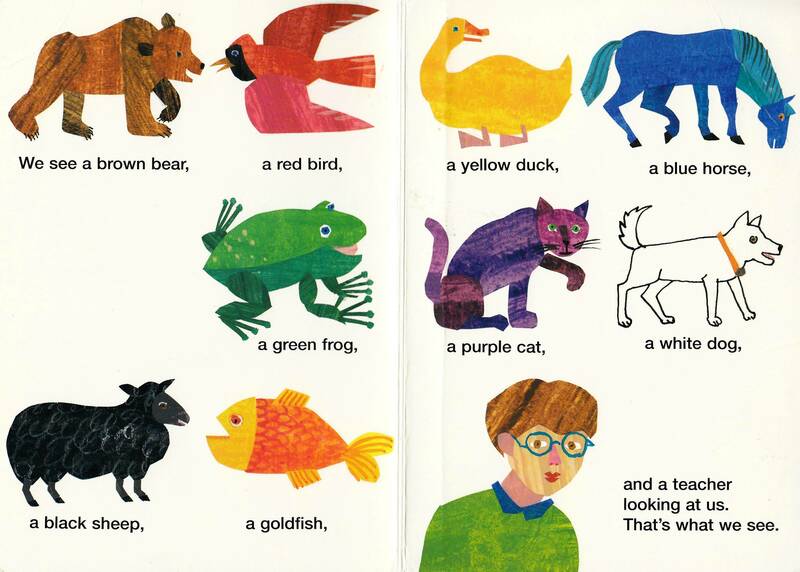 I loved that a book about animals and their colors drew her in so deeply that she actually had to ask at one point, “Are they speaking directly to me?” That’s amazing. I’m not a religious guy at all, but, when I used to read books like Goodnight Moon and Brown Bear, Brown Bear, What Do You See? to my daughter at bedtime, it always felt like the equivalent of doing our evening prayers. If you can find a great rhythm read, it feels like performing a rosary. Granted, the experience has significantly less dogma and way more duckies and bunnies, but the overall vocal power of the reading, of chanting that mantra, I think, remains the same. So, if you have a young one, a kid still young enough that they can be lulled to sleep by the sound of their parents’ voice, I can’t recommend Brown Bear, Brown Bear, What Do You See? more highly. To some, it will seem like a very, simple boring text and, to others (like me), it will feel like a prayer. Maybe I’m just mythologizing a board book that my daughter took a shine to – a valid concern – or maybe not. Regardless, in the right hands (and with the right voice), Brown Bear, Brown Bear can be a powerful – one might even say “essential” – title in any home library. Note #1: I do know that there’s an audio version of Brown Bear, Brown Bear read by Gwyneth Paltrow out there. (Some editions of the book come with a CD of it.) I’m not going to rip on the lovely Ms. Paltrow, but, to me, I can’t imagine wanting to let someone else read this book to my kid. There is something just poetic and personal about a book like Brown Bear and – while I love audiobooks – it just doesn’t seem like the reading would have the same power coming from a recording. Note #2: Martin and Carle have also collaborated on several other animal-themed books – Polar Bear, Polar Bear, What Do You Hear? ; Panda Bear, Panda Bear, What Do You See? ; Baby Bear, Baby Bear, What Do You See? – and they’re all pretty good reads. However, to be completely honest, while my daughter enjoyed them, they never inspired the same deep emotions in her that the original Brown Bear, Brown Bear did. well said Tom – sometimes the simplest stories (and toys) are just the most enjoyable.